I am so impressed with your program. It is clearly a labor of love and I think it targets a segment of the population that is in need of empowerment and partnership with their health care providers to have tools to help them cope and heal. I have been involved with social work and integrative care for the past 20 years and I really do think this is an exciting and meaningful venue for patients. Thank you for sharing and I will be sending your information to other NYC Hospitals with integrative care departments. Please keep me posted. 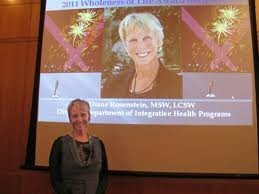 The 2010 recipient of the Wholeness of Life Award from HealthCare Chaplaincy, a nonprofit organization that specializes in multifaith, spiritually centered healthcare. 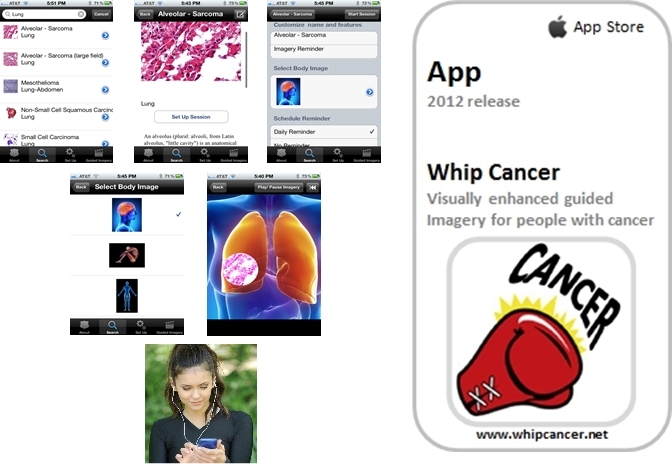 Whip Cancer is a form of non-pharmaceutical immunotherapy. For a long time doctors suspected that the immune system had an effect on certain cancers. Even before the immune system was well understood, William Coley, MD, a New York surgeon, first noted that getting an infection after surgery seemed to help some cancer patients. In the late 1800s, he began treating cancer patients by infecting them with certain kinds of bacteria, which came to be known as Coley toxins. Although he had some success, his technique was overshadowed when other forms of cancer treatment, such as radiation therapy, came into use. Since then, doctors have learned a great deal about the immune system. This has led to research into how it can be used to treat cancer, using many different approaches. In the last few decades immunotherapy has become an important part of treating several types of cancer. Immunotherapy seems to work better for some types of cancer than for others. It is used by itself to treat some cancers, but for many cancers it seems to work best when used along with other types of treatment. As researchers have learned more about the body’s immune system in recent years, they have begun to figure out how it might be used to treat cancer more effectively. Newer treatments now being tested seem to work better and will have a greater impact on the outlook for people with cancer in the future. Your immune system is a collection of organs, special cells, and substances that help protect you from infections and some other diseases. Immune system cells and the substances they make travel through your body to protect it from germs that cause infections. They also help protect you from cancer in some ways. It may help to think of your body as a castle. Think of viruses, bacteria, and parasites as hostile, foreign armies that are not normally found in your body. They try to invade your body to use its resources to serve their own purposes, and they can hurt you in the process. In fact, doctors often use the word foreign to describe invading germs or other substances not normally found in the body. The immune system is your body's defense force. It helps keep invading germs out, or helps kill them if they do get into your body. The immune system basically works by keeping track of all of the substances normally found in the body. Any new substance in the body that the immune system does not recognize raises an alarm, causing the immune system to attack it. Substances that cause an immune system response are called antigens. 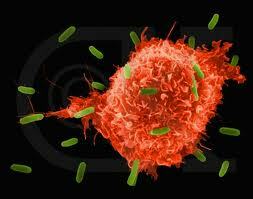 The immune response can lead to destruction of anything containing the antigen, such as germs or cancer cells. Germs such as viruses, bacteria, and parasites have substances on their outer surfaces, such as certain proteins, that are not normally found in the human body. The immune system sees these foreign substances as antigens. Cancer cells are also different from normal cells in the body. They often have unusual substances on their outer surfaces that can act as antigens. But the immune system is much better at recognizing and attacking germs than cancer cells. Germs are very different from normal human cells and are often easily seen as foreign, but cancer cells and normal cells have fewer clear differences. Because of this the immune system may not always recognize cancer cells as foreign. Cancer cells are less like soldiers of an invading army and more like traitors within the ranks of the human cell population. Clearly the immune system’s normal ability to fight cancer is limited, because many people with healthy immune systems still develop cancer. The immune system may not see the cancer cells as foreign because the cancer cells (and their antigens) are not different enough from those of normal cells. Sometimes the immune system recognizes the cancer cells, but the response may not be strong enough to destroy the cancer. Cancer cells themselves may also give off substances that keep the immune system in check. To overcome this, researchers have designed ways to help the immune system recognize cancer cells and strengthen its response so that it will destroy them. Abstract: Cancer immunotherapy attempts to harness the exquisite power and specificity of the immune system for the treatment of malignancy. Although cancer cells are less immunogenic than pathogens, the immune system is clearly capable of recognizing and eliminating tumor cells. However, tumors frequently interfere with the development and function of immune responses. Thus, the challenge for immunotherapy is to use advances in cellular and molecular immunology to develop strategies that effectively and safely augment antitumor responses. Howard Hall, measuring the effects of healthy people imagining their White blood cells as strong as powerful sharks, found a number of subjects could demonstrate an increase in the number of lymphocytes as well as an increased responsiveness of the immune system after the session as compared to before [Hall H R1983 Hypnosis and the immune system. American Journal of Clinical Hypnosis, 25:92-103]. K. Kolcaba and C. Fox measured the effectiveness of customized guided imagery for increasing comfort in early stage cancer. They found that listening to a guided imagery audiotape once a day for the duration of the study indicated a significant overall increase in comfort over time, and was especially salient in the first three weeks of therapy. [Oncol Nurs Forum 1999Jan-Feb; 26(1): 67-72]. L. Baider, et al. examined the long-term effects of relaxation and guided imagery on patients recently diagnosed with cancer at Hadassah University Hospital. Results showed a decrease in psychological distress and an increase in the patient's sense of internal control [Gen Hosp Psychiatry 2001Sep-Oct; 23(5): 272-7]. Dr. Alan Watkins states that every idea, thought and belief has a neurochemical consequence, which is what makes imagery such a significant mind-body bridge. He writes that the flow of neuropeptides from the CNS, which enhances or inhibits one’s immunology through two major neuro immuno modulatory pathways; neuroendocrine and autonomic, are critically important in maintaining health and fighting disease [Mind-bodymedicine: a clinician's guide to psychoneuroimmunology, Watkins, A. 1997Churchill Livingstone, NY]. D. L. Tusek and R. E. Cwynar of Ohio observed that patients often describe the experience in a hospital as overwhelming, evoking fear, anger, helplessness, and isolation. Tusek and Cwynar identify guided imagery as one of the most well-studied complementary therapies useful in improving patients’ experiences as they prepare for a procedure or manage the stresses of a hospital stay [AACNClin Issues 2000 Feb; 11(1): 68-76]. V. W. Donaldson in NC at the Center for Stress Management examined the effects of mental imagery on the immune system response, and specifically, on depressed white blood cell (WBC) counts. Results indicated significant increases in WBC count for all patients over a 90-day period, even when possessing disease and illnesses that would have predicted a decrease in WBC count [ApplPsychophysiol Biofeedback 2000 Jun; 25(2): 117-28]. D. S. Burns at the Group/Walther Cancer Institute found that individuals who participated in guided imagery sessions scored better on both mood scores and quality of life scores than those who did not. Interestingly, these scores continued to improve in the experimental group, even after sessions were complete, indicating that guided imagery is effective in improving mood and quality of life in cancer patients [J. Music Ther. 2001 spring; 38(1) :51-65]. Gaston-Johansson et al. 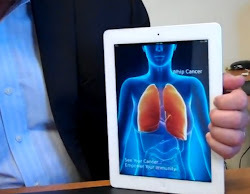 of Johns Hopkins University School of Nursing in Baltimore, Maryland showed significant benefits from the use of information, cognitive restructuring, and relaxation with guided imagery in those patients with breast cancer who underwent autologous bone marrow/peripheral blood stem cell transplantation. This strategy was found to be effective in significantly reducing anxiety, nausea, and nausea combined with fatigue 7 days after surgery when the side effects of treatment are usually the most severe [Cancer Nurs 2000 Aug; 23(4):277-85]. D.A. Rapkin, M. Straubing, and J.C. Holroyd from the University of California, Los Angeles explored the value of imagery-hypnosis on recovery from head and neck cancer surgery and found there were fewer surgical complications and less blood loss during surgery [Int J Clin Exp Hypn 1991 Oct; 39(4): 215-26]. L. LeShan found that psychological conditions had an enormous influence not only on the production of cancer, but also on the disease’s evolution and even on the person’s response to a particular treatment LeShan L, Worthington R 1956 Personality as a factor in the pathogenesis of cancer: a review of the literature. [British Journal of Medical Psychology 29:49-56]. A study by J. A. Royle, et al. of Ontario, found that guided imagery was the intervention best used by nurses to decrease patient anxiety [Can Oncol Nurs J 1996 Feb; 6(1): 20-5]. 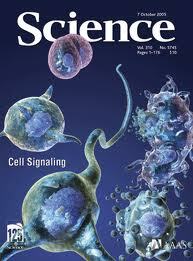 A June, 2008 critical review in the International Journal of Neuroscience by Ephraim C. Trakhtenberg from the Institute of Transpersonal Psychology and Stanford University in Palo Alto, California, looked at the research on the effect that guided imagery has on immune system functioning and proposed direction for future research. Trakhtenberg found that the studies suggest that guided imagery can reduce stress and up-regulate the immune system; that cell-specific imagery affects corresponding white blood cells (WBC’s)- neutrophils, or lymphocytes; that decreases in WBC count occur in the initial stages of GI and relaxation, due to fluctuations in WBC production or margination; and that changes in WBC count or adherence occur earlier in medical patients. The investigator suggests that future articles define the ideal WBC count; investigate the effects of long-term practice of GI; and clarify the influence of cell-specific imagery on white blood cells.